With extensive professional expertise in all types of domestic and commercial removals in Lewisham SE13, Sky Removals is the reliable service partner your moving project needs. We deal effectively with all types of home and office relocations in SE13, and provide the right removal solutions at the right price. From removal of single items to full scale property relocations, and all in between, Lewisham based households and establishments can enjoy efficient, inexpensive removal and delivery services, without any additional hassles. Budget-friendly service – we stick to flexible pricing schemes, based on individually prepared service quotes which reflect the actual specs of the job. We aim to meet our customers’ budget requirements in full through fair, adequate pricing, without any hidden fees or other such nonsense. We are more than happy to come out to you for a preliminary viewing and onsite quotation as to make the removal even more affordable and efficient. Friendly, knowledgeable and well organised removal teams – our removal technicians and drivers are qualified professionals who approach every aspect of house removals in Lewisham SE13 with the due precision and care. They will take into account any and all considerations and specifics concerning your removal as to ensure quick, safe and efficient completion of the entire project. End to end coverage of all stages and requirements – no matter how big or small your home relocation in SE13, we will organise and cover accordingly all stages of the process, this will also include packing and securing of items, as well as any other prep work required. Additional options and services can also be included in the removal, these are listed further down this page. Punctuality and efficiency – our removal teams go about their duties with professional pace, precision and efficiency, just as expected and required. Cost efficient service – we plan and carry out the entire removal, and all additional aspects as to provide genuine value for money, and save our business customers in Lewisham SE13 any unnecessary expenses. Convenience and flexibility – we carry out our business removals in SE13 in a customer specified time, in order to minimise disruption and downtime, the service will be organised and carried out as per individual requirements. 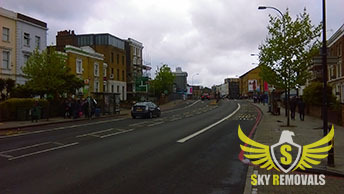 So, why choose Sky Removals for your property removal needs in Lewisham, after all? Most affordable service provider in SE13 We ensure optimal value for money in all cases. We quote each customer individually, and consider all aspects of the job, in order to come up with the lowest price. Genuine value for money is guaranteed as we can organise for additional services, or organise the removal as per specific customer needs and wants. 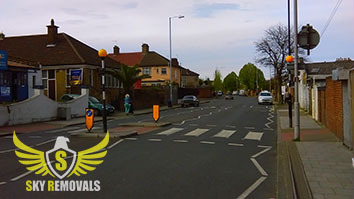 Specialised transportation, qualified technicians All of our removals in Lewisham SE13 are carried out by specially trained and qualified drivers and helpers as to ensure safe handling and timely delivery of all items. Transit of goods from A to B takes place in clean, well maintained removal vehicles of the appropriate size and load capacity. Attentive and helpful customer service We maintain active communication with our customers during the entire service. Our helpful and knowledgeable customer advisors will provide you with the necessary information and assistance via phone or email. Various additional services to choose from We are licensed and qualified to carry out fixed schedule pickup and delivery, full property clearances, professional home and office cleaning, arrange for long / short term storage solutions and more. The London Borough of Lewisham (covering most of SE13 postal area) is a district in southeast London. Lewisham is governed by Lewisham Borough Council, headquartered in Catford. However, the principle town of the borough is Lewisham itself. The borough forms part of Inner London. The Prime Meridian (Zero GMT) passes through the borough. Lewisham Borough was formed midway through the nineteen sixties, by a merger of two former administrative divisions, that of Lewisham and Deptford. No major boundary changes had taken place until nineteen ninety six, when the former Deptford Royal Dock area was transferred from Lewisham to Greenwich Borough. The borough has a short riverfront at its northern boundary, facing the Isle of Dogs. Home to about two hundred and ninety three thousand residents, Lewisham also features a number of well-known places and landmarks, such as All Saints Church in Blackheath, Horniman Museum in Forest Hill, and the Citibank Tower – a familiar part of London’s skyline. Currently, there are no Tube stations serving the borough, however there are plans to extend the Bakerloo Line to Lewisham and Hayes. Aside of having the knowledge and technical capacity to organise and carry out domestic and commercial relocations, we also have the necessary assets to properly execute specialised removals in Lewisham that involve the hauling of large, heavy and delicate items such as musical instruments, vintage furniture, glassware, office equipment, construction machinery and etc. Keep in mind that we provide our specialised moving services for reasonable prices which can fit into any budget. Booking us is extremely easy and straightforward as we work with a flexible agenda which always has free slots for new Lewisham property removal projects. It is because of our well-drafted calendar that we are able to accept last minute bookings and conduct late night operations. Know that you can contact us at any time of the day as we maintain a customer support centre which is at your disposal 24 hours a day, 7 days a week. We can easily haul even the largest quantities of goods with as few trips as possible due to the fact that we have an armada of new and clean Lorries and Lutons. We have equipped our vehicles with the latest satellite navigational systems and top quality safety features that keep everything in place during transit. We also rent out our moving vans and trucks at affordable fees. The Broadway Theatre is perhaps the most noted entertainment venue in the London Borough of Lewisham. It was built during the early 1930s and designed by the renowned English architectural firm, Bradshaw, Gass and Hope. The theatre is considered to be one of the finest example of Art Deco design despite have Gothic features. The venue has two halls: Main Hall with a capacity of 800 seats and Studio Theatre with a capacity of 100 seats. Another well-known structure in the borough is St. Paul’s Church which is known for its Baroque design.